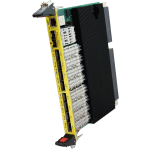 WILDSTAR™ OpenVPX FPGA embedded Switch boards are an important part of the Annapolis Wild40 EcoSystem™. They allow non-blocking switching between backplane slots of multiple channels of 40Gb Ethernet or QDR Infiniband. They also have front panel IO which can be used to connect the system to external data sources.